They say fame is a double-edged sword. With all the limelight you are going to get some unsavoury attention too. 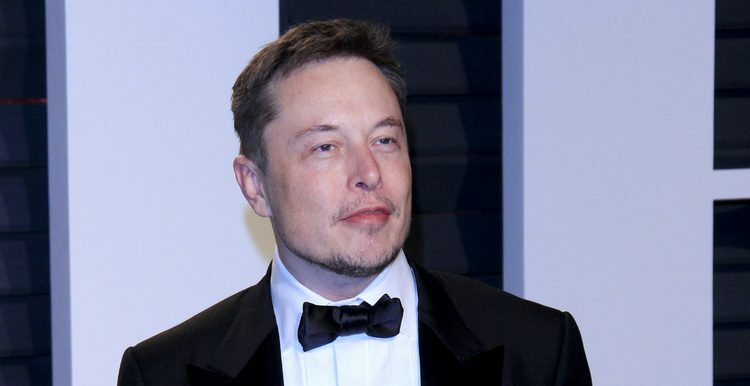 Elon Musk knows this now as he’s embroiled in a strange new cryptocurrency scam on Twitter. For the past few weeks, scam accounts have been using Twitter handles with names close enough to Elon Musk to fool unsuspecting Twitter users. These accounts also have the same profile picture that Musk has used. While they don’t have the verified badge, it can fool someone who may have heard of Musk but doesn’t know much about Twitter. Some examples of the handles are @elon_musk_, @elonmursk, @alonmusk, @elonmursk, etc. But since the name clearly says ‘Elon Musk’, it’s enough to convince some unsuspecting users that the account is legitimate. But that’s not all. 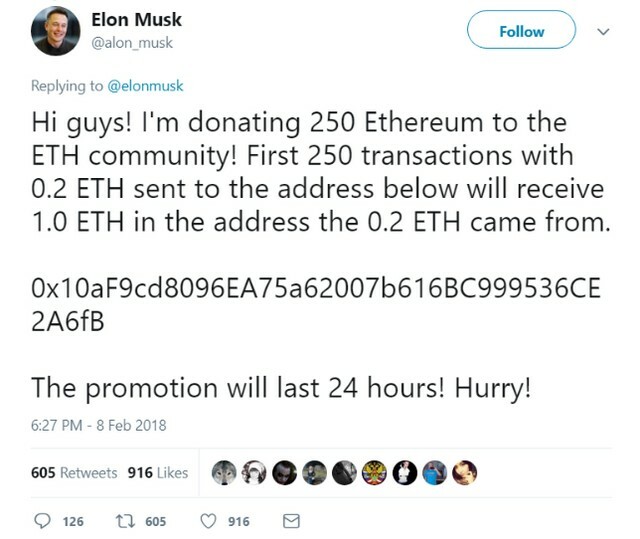 In a bid to boost the authenticity of their fraud, the scammers followed Musk, and replied to his previous message in a contextual tone to make their offering appear like the real deal. Terms like celebrating or commemorating the launch of certain satellites by SpaceX are a recurring element. I'm ɡіvіnɡ аwау 4,000 ЕТН tо соmmеmоrаtе thе lаunсh! То раrtісіраtе, just sеnԁ 0.3-2.0 ЕТН tо the aԁԁress bеlоw аnԁ gеt 3-20 ЕТН bасk. If yоu'rе lаtе, your ЕТН will bе sеnt bасk. The whole premise of Musk giving away Ethereum to celebrate an achievement is far-fetched, but it can fool the gullible since it can be seen as a billionaire being generous. Similar tweets and replies in the name of Elon Musk have been appearing all over the social media platform. To further silence the alarms of suspicion, the scammers even created accounts of fake beneficiaries, who have received hefty returns after transferring their cryptocurrency to a particular Ethereum address. heya. received mine ETH fair and square. Elon, please hold such giveaways everyday! Your giveaways are the best of the bunch. I can probably do this a couple of times, will try. Thank you Elon! Just received 5 eth – awesome! Please Hold these promos once a week! Moreover, to further calm the suspicion of users, the scammers created a fake webpage which showed a large number of active Ethereum transactions on the address mentioned in the fake tweet. The link posted in such fraudulent tweets directed users to the same Ethereum transaction page in order to further quash any suspicion. Naturally followers of Musk and other Twitter users have been urging Twitter’s team to check and stop this scam. BuzzFeed News reporter Ryan Mac said he informed Twitter to act against the scammers, but that was not enough to stop all the scam tweets. Twitter shut down some of the accounts we brought to their attention, but seem to have no interest in being proactive about this matter. These accounts took me less than a minute to find using the search function and some key terms. Musk’s fame is just one factor; the scam has a high chance of working due to the rapid surge in popularity of Ethereum. Ethereum continues to surge, despite its comparatively lower trade value, and is largely seen as a stabler alternative to Bitcoin. Of course, Musk is well-aware of the situation and how his name is being misused. The Tesla chief further revealed that apart from a .25 BTC, he owns no crypto money at all. Twitter had acted recently against accounts which were using verified badges to scam cryptocurrency enthusiasts. But it’s not yet taken any decisive action against the wannabe-Musks shilling cryptocurrency.